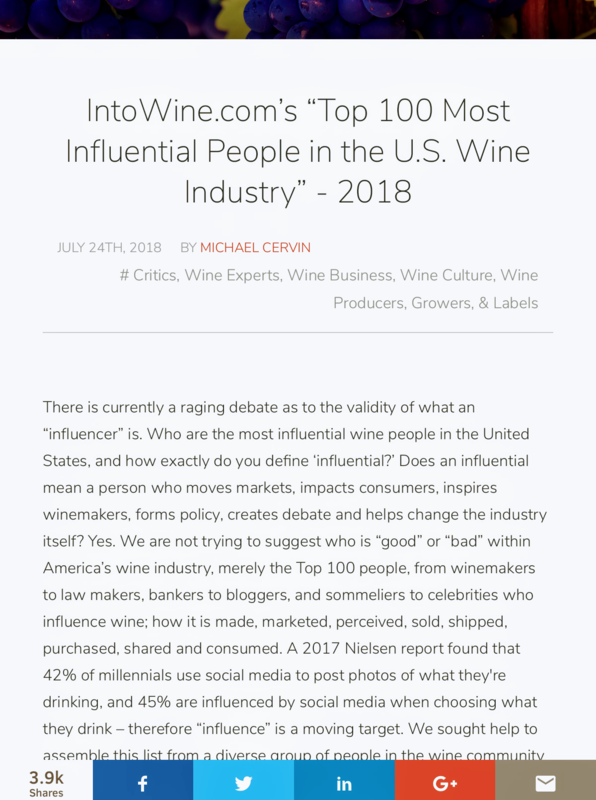 It’s hard to believe that it’s been a full five years since my friend, fellow wine competition judge, all-around decent guy, and prolific author Michael Cervin assembled the last edition of the Top 100 Most Influential People in the US Wine Industry. So much has changed in those ensuing five revolutions around the Sun that it’s simply mind-boggling to consider the volume… wow, I’m only two minutes into penning this and I already need a drink…! 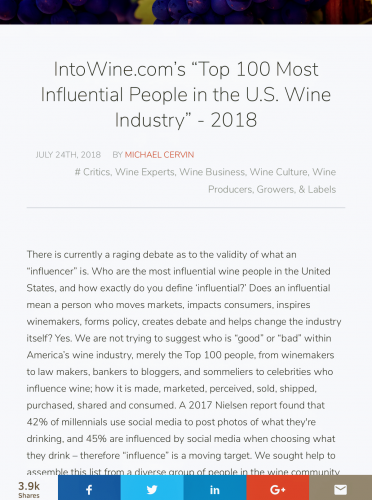 Intowine.com has recently published Michael’s 2018 version of that US wine biz influencer list, and as always the results are almost equal parts educational, seemingly-inevitable, and controversial (at least one of the names from this year’s list has been associated with infamous wine fraudster Rudy Kurniawan). While I don’t have detailed insight into how this list gets constructed, I do know that Michael has, in previous incarnations, canvased industry professionals of various stripes regarding who they see as helping to (directly or indirectly) move the markets when it comes to wine, and frequency of mention from those results was a key determinant for if and where names are placed on the list. From my vantage point, the newly revised list does a good job of encapsulating the state of the current US wine biz “union,” despite some questionable omissions (see this discussion as an example; I can also offer up Eric Orange as being at least as – or more – influential than a third of the people appearing on the 2018 list). Winemakers, who have at times been seen in a sort of Cult of Personality spotlight within wine appreciation circles, should probably be a bit humbled by the new list: they make up only about ten percent of it. 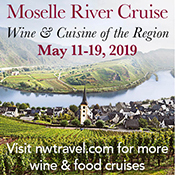 Wine media seem to have a more dominant position, with writers, critics, show hosts, and the like (many of whom I know, consider to be friends, and are talented, dedicated, and hard-working people) taking up a large number of the 100 slots, and occupying 14 of the top 25 places. Perusing the top quartile of this list clearly suggests that the influence of wine media in general has waned – at least somewhat – in the last five years. The Age of Wine Industry Consolidation (whether perceived as “Golden” or “Dark” will depend largely, I suspect, on your view of corporate latitude, or maybe who writes your paycheck) is clearly upon us, and that state of affairs is well reflected in the 2018 list. Large conglomerates of wine brands, major regional alcohol distributors, and lead buyers for huge (and I do mean huge) store chains take up almost half of the top 25 spots this year; most notably, and probably quite tellingly, they occupy all of the top 3 positions. This is all just reality being reflected, of course, but I hope Michael’s new list gives those in the wine biz some contemplative pause; is it healthy for the US wine industry as a whole if those entities become too big or too powerful? You already know the answer to that one; and we (wine brands and PR people, I’m looking at *you*) need to be careful that we don’t simply allow a power play substitution of one influencing group (media) for another (the downstream pipeline players of the USA’s incredibly outdated – and arguably anti-capitalist – three-tier alcohol distribution system). I think it is interesting how there are so many large wine distributors and purveyors on the list, but I wouldn’t buy any of the wines that they distribute or push. I really believe that the top 100 should include more small wine makers that really make up the heart of the wine industry. Stephen – while I absolutely understand and respect that viewpoint (and it’s what I spend the majority of my time here on 1WD covering), those small winemaking operations usually don’t move the sales needle much when compared with the large distributors and producers. I do sometimes wonder how many times the same people have been on these types of lists for the last decade. Wonder if there’s an analysis somewhere. My guess would be over 50% stay on the list until they retire or expire. Like most Top Lists you’re going to have the Big Boys (and Girls) dominating. It’s important to continue to bring new blood to the industry and further develop the influencer of those already doing good work.